Let&apos;s be honest, if you compete in sports, you want to win. Charlottesville is the same way. Not only is the town is proud and competitive; it wins. Often. That&apos;s why no one in Charlottesville was surprised when the city was named the "#1 Best Tennis Town in America" byTennis magazine. After all, the University of Virginia Tennis Team has led the country in attendance for several years and the area hosts two professional USTA tournaments each year. Few others were surprised when Forbes magazine placed Charlottesville on its list of "Top 10 College Sports Towns." 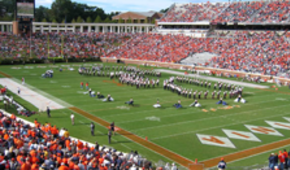 Cavaliers fans have been piling into the football, basketball, lacrosse, soccer, and baseball stadiums for years andSports Illustrated once said "A sports weekend in Charlottesville will be among the best road trips you take." WhenAssociated Press placed Charlottesville in its "Top 12 College Football Towns In America" over places like Auburn, Alabama and Norman, Oklahoma it was only a confirmation of what those around town already knew. College sports aren&apos;t the only spectator events around town. Twice a year, around 20,000 people flock to Albemarle County to participate in the Foxfield Races, a prestigious steeplechase event. Speaking of horses, King Family Vineyard hosts polo matches from spring to the fall, often drawing hundreds of avid fans. Check out the calendar below to see all the upcoming games and matches that Charlottesville has to offer. Home to UVA Tennis teams. Seats 1,000 for matches. Virginia has led the nation in attendance two straight years.